Pull handle 2 gently to release the pins from their mounting points located on each side of the luggage boot. Guide the luggage cover onto the roller. Using the handle 2, push the luggage cover to the right (movement A) and lift the left-hand side (movement B) in the inertia reel. To refit the luggage cover, insert the right-hand side, then push it to the right (movement A) and lower the left-hand side of the inertia reel into its housing. 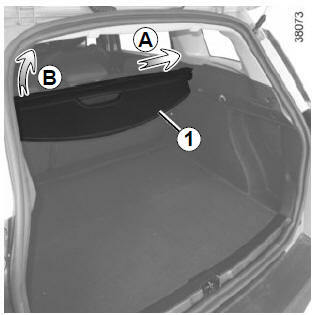 Lift the mobile floor (please refer to the information on “Boot storage space and fittings” in section 3). Store the luggage compartment cover by inserting it, one side at a time. 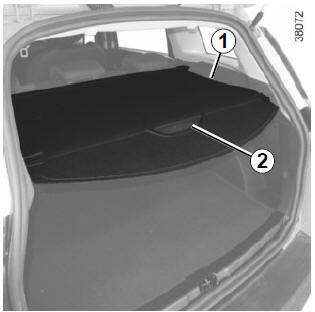 Do not place any objects, especially heavy or solid objects on the luggage compartment cover. These may pose a risk to the vehicle occupants if the driver has to brake suddenly or if the vehicle is involved in an accident.